Expedition 341: It’s going to be good! Tomorrow morning the JOIDES Resolution will be cruising into the Strait of Juan de Fuca, a large body of water that separates Canada from the U.S. The rocky shores of the Strait of Juan de Fuca are home to kelp forests, which are among the most productive ecosystems on the planet. Kelp is actually marine algae and it has a very sturdy structure, consisting of a round, root-like structure connected to a stalk on one end, and leaf-like fronds on the other. 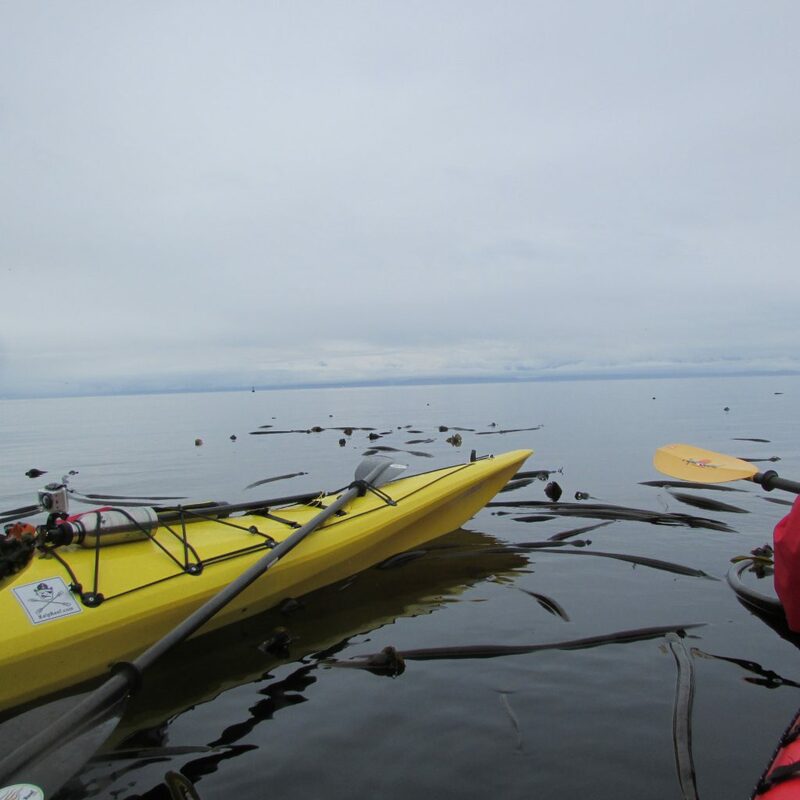 Our fantastic kayaking guide from Kelp Reef Adventures, Brad, told us that in the summer months kelp can grow at a rate of 1 meter per day! It’s a good thing because kelp forests provide a habitat for a variety of marine organisms, from primary consumers like fish, all the way up the food chain to the many species whales that live in the area. I also learned that kelp is pretty delicious. You can scoop it right out of the bay and snack on the leaf-like fronds, which are a great source of iodine. You can also eat the stalk, which is apparently delicious when pickled. Answer: There’s enough carbon monoxide (CO) stored in the stalk to kill a chicken! OK, maybe this joke is more humorous while floating atop a kelp forest. It’s true, the hollow root and stalk are a reservoir of carbon monoxide. Who knew kelp was so fascinating? OK, one more thing about kelp. Guess where the modern water bottle originated? You guessed it: KELP! Our ancestors would cut off the kelp fronds (then snack on them, of course), and then use the hollow stalk to hold water. Unfortunately, kelp forests across the globe are in danger, primarily due to overfishing by humans. But what does overfishing have to do with kelp, one of the most miraculous forms of marine algae? Well, ecosystems are delicate, and taking one organism out of a food web has a domino effect on the rest of the marine ecosystem. When the number of fishes in a kelp forest declines rapidly due to overfishing, there are fewer predators of herbivores.When herbivore populations are left un-checked, they begin to over-consume kelp. Can you see where I'm going with this? When kelp is overgrazed things start to spiral out of control, because less kelp results in even fewer fish in the ecosystem. Scientists refer to this as a positive feedback loop, a process in which a change in a system causes an increasing change in the same direction within the system. Eventually the effects of kelp forest degradation impact top predators in the marine ecosystem, such as harbor seals that feed on the fishes, and whales that feed on the harbor seals. A sea cucumber poses for the camera! Can you see the sea urchins in the water in the image above? (hint: look for the pink & purple spikes). These organizms are examples of herbivores whose populations are kept in balance by sea otters. Harbor seals love to hang out on the rocky islands, surrounded by kelp forests.